There was a touch of frost this morning for my first birding of 2017. I waited until the sun began to rise and then set off through Hambleton towards Out Rawcliffe, watchful for both patchy ice and any roadside birds. First off, and just on the edge of the village was a Kestrel in a now familiar spot. Later there would be a second Kestrel and then a third, the latter taking great interest in a flock of Linnets. But for now I stopped near a farm where I hoped that the morning frost might bring a Little Owl out to play. There’s no doubt that snow, ice and frost cause Little Owls to be more visible. My theory is that frozen ground makes the owl’s prey, typically worms, beetles, moths and small mammals, easier to spot with the prey less likely to escape into frozen earth and vegetation. Little Owls catch prey by stooping on it from a perch or running after it on the ground. The owl’s natural instinct probably makes it spend more time hunting in cold weather as a safeguard against the unforeseen. Also, and like other species of owl the Little Owl is in the habit of keeping a “larder” of food for the unexpected events of life. It’s rather like us humans stocking our cupboards with tinned food or filling the freezer with Hovis. Unfortunately, fresh voles don’t come with a “use by date”, nor is an owl very house-proud in cleaning behind the fridge; as any ringer will testify, the content of an owl nest is often extremely messy and very smelly. The owl was both watchful and at the at times disinterested enough to close its eyes and face into the morning sun. Shame it was a little distant, but at least one for my non-existent year list. 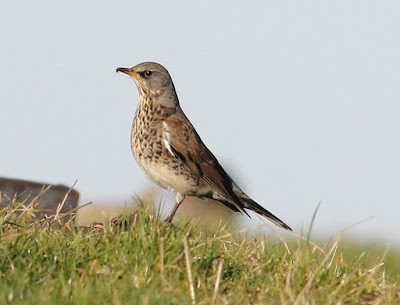 I found myself along Crook Lane where Fieldfares lived up to their name by feeding in roadside fields. During the morning I noted that almost without exception our local hedgerows are now devoid of hawthorn berries, the favoured autumn food of the Fieldfare as they now switch seamlessly to searching for earthworms and field dwelling insects. I saw a dozen or so Redwings along the lane but they were gone as soon as look at them. If anything an always nervous Redwing is shyer than the watchful Fieldfare. The roadside flood at Rawcliffe Moss is no longer a budding lake but just a very damp and obviously still soggy pasture with dozens of Lapwings probing the ground and gulls waiting to test their piracy skills. Across the far side there was a fence-sitting Buzzard and closer, a Kestrel that flew periodically into the building and then out again to sit along the fence. Two Pied Wagtails here. At Union Lane were 40 or more Fieldfares and 8 Stock Dove, both in exactly the same field as last week. And at Gulf Lane came the third Kestrel of the morning keeping watch on our set-aside where 200+ Linnets flew around, flew around, and then flew around again. The Kestrel was definitely making the finches nervous and although a Kestrel feeds mostly on mammals, should an opportunity arise, the Kestrel would take a Linnet. Cockerham Moss Edge held a distant flock of several hundred Pink-footed Geese. The geese were adjacent to a private farm track a good half mile away and with new groups arriving as I watched. I could have driven down the track but decided to leave the geese feeding rather than risk sending them back into the air and towards the sound of gunfire. Around the moss road to Crimbles; 40 Curlew, 35+ Lapwings, 1 Grey Wagtail, 1 Pied Wagtail, 1 Skylark, 2 Reed Bunting, 7 Tree Sparrow, 15 Chaffinch, 18 Fieldfare, 12 Blackbird, 2 Song Thrush and 1 Mistle Thrush. The Mistle Thrush is the largest of our UK thrush family but equally as shy as all of the others. One rattled off from our back garden the other day when I came by the side of the garage and surprised the thrush feeding on what’s left of the crab apple tree. Any day now male Mistle Thrushes will begin their loud singing from a high point in the landscape, usually the tallest tree, and often on a stormy day. “Stormcock” is an old English name for the Mistle Thrush because unlike most birds it sings in the heaviest of weather. “Singing in the Rain” - no problem to a Mistle Thrush. Turn left at Crimbles and I’m soon back at Braides Farm where the frost put paid to much other than 200+ Golden Plover, similar numbers of Lapwings and 50 or so Redshanks. Apologies that my pictures are a little distant today. Sometimes these birds just don’t want to play ball with us birders. Anyway I have decided to spend my generous £100 Christmas Bonus towards upgrading my current camera to a later version in the hope my photography will improve. In any case Mrs Theresa Maybe, and with your own and other leading Minister’s veiled threats to target the oldies. A miserly £100 is hardly enough to buy something really trendy and useful like an iPhone 7, an Apple Watch or a Microsoft Band is it? 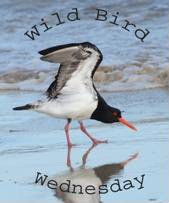 Linking today to Eileen's Saturday and World Bird Wednesday. Amazing observations! Little Owls and Redshank are really nice. Happy New Year! The encounter with the Little Owl was obviously very special. I have very fond memories of them from my visit to the UK in 2015. Now here is the question of the day...what is Hovis? Hello Phil, the Little Owl is adorable. The Redshank is another favorite. Great post for the New Year and wonderful photos. I am Florida for the winter and I do not miss the cold and ice. Happy Tuesday, enjoy your day! Wonderful photos. The Little Owl is my favorite. Fantastic pictures. I was watching a Mistle Thrush this week guarding a berry bush very aggressively. I thoroughly enjoyed your first post of the New Year! Looking forward to more because, well, I'm just greedy. Gini and I hope you and your family had a joyous holiday season! We're looking forward to trying again this year for some sort of regularity in our exploring and birding. No promises. Thank you for the birding trip, even though it was definitely a bit frosty for my delicate sensibilities. At least you provided plenty of birding diversity! I am certain the geese appreciate your letting them eat in peace and not sending them toward the gunners. Good show on finding a Little Owl prepared to raid the freezer. I've not actually seen an owl in months but have heard many vocalizing in preparation for breeding season. I must hurry now, before Gini beats me to the last sugar cookie! Birding here has been good but now I must discover a way to make that blog thing operational again. Phil, seriously, thank you for being a steady source of inspiration and motivation. It is much appreciated. Pictures look good to me - really like the little owl. Strange to watch the antics of Mrs. Maybe from a long way away. I'm finally back to blogging after the Christmas hiatus, and I had to stop by to see what you've been up to these days. I SO LOVE that owl photo in the sunlight. Icy? Oh no...not here. But it's chilly. I am just about ready to leave on a drive around the bay to see what birds I can find. I do hope you're having a great beginning for the new year Phil. I will be back in action, visiting those birders who link up at I'd Rather B Birdin this coming weekend. I've missed all the beautiful birds and look forward to it all again. I've been hunting high and low for our owls. None for a month!!! You know I am partial to owls and that little owl is just the cutest. We heard owls on our hike yesterday but I still haven't seen one to take pics of it. Maybe this year will be my year! Happy New year! What a cute owl and a Happy healthy New Year to you and your family. I heard on the local news that there was a rare blue rock thrush in our area and I thought of your twitcher post. I prefer to watch the birds in peace. Have a lovely weekend. Oh brother... things don't sound too good politically over on your side of the pond, but I'm pretty sure we'll win the worst ever title. Kakistocracy is the new word ... government by the worst. I try to stay happy and engaged with the things we enjoy. All we can do. Anyway ... you bird photos look fine to me. The little owl is really great.